I want to keep bees! Where do I start? I get this question several times every year when interest in bees and beekeeping spring up like so many dandelions in the front yard. Usually, the questions begin when the flowers are blooming, temperatures are rising and folks begin to pay attention to their yards. By this time, it is a bit late in the game to get started, but not all is lost. One has to start *somewhere* and now is as good a time as any. In this post my primary goal is to help you, a beginner, get a good head-start along the path to beekeeping in excellence. In my mind, an excellent beekeeper is self-sufficient, confidently understands his bees, the plants in his locale, how to manage his colonies and how to keep most of them alive each winter. The following information below highlights key areas of information and experience that you will need to incorporate on this path to excellence. In the process of reading this blog, you may feel like postponing your entry into beekeeping for another year. To be honest, that can be a great thing! There's much to learn and prepare for and I take great stock in Benjamin Franklin's old proverb, "If you fail to plan, you are planning to fail!". Far too many jump headfirst into beekeeping without a mentor, understanding the basics or counting the cost. This can be a detriment not only to them but their bees and other local beekeepers. Are you up for the challenge? Are you committed to excellence? Okay, great... let's begin! I have added a clickable index just below to help you navigate and jump back into the post over time. ALL of this info is important for you to grasp within the first couple years of beekeeping ― much of it right away. Skip around, but please understand that none of this can be neglected in your path to becoming an excellent beekeeper. Join the "OTS Beekeeping" Group! Bee veil or jacket - Something bee tight to protect your face is the most pressing need and then something to cover your arms. I've found the middle-of-the-road jacket with integrated veil is both easy and sufficient. You don't need an astronaut suit! Conversely, all beginners should begin with at least a veil until you have gained a year or two experience. Only then try without gloves or veil. After nearly 15 years, I don't recommend it. I'm always covered and take no chances. Smoker, including dry fuel and lighter - Start your smoke with a half-sheet of newspaper and let it get the container hot, then add small bits of pine needles or other dry combustible material that has no chemicals or man-made materials. Once it's burning well on its own, stuff it with the material and close it up. Puff it every once in awhile to keep it rolling. Gloves - Nitrile gloves or animal skin gloves are all good; pick your preference. Hive tool - Start with the cheapest and simplest tool and work from there. I've settled on a heavy-duty tool that has a hook on one end to easily pry under frame ends. Standard Langstroth hives - I personally started out in 2004 in the most difficult manner by building a top bar hive from scratch. I wouldn't recommend! Start with the standard hive we call the "Langstroth" and go from there after a year or two after you've seen how things work. Same size frames throughout apiary using either deeps or mediums - With the OTS system, you'll especially want to also standardize on the frame size throughout your apiary. This means all frames (honey, brood, etc) will all be either deeps or mediums. Most beekeepers will buy and sell nucs with deep frames. I personally have standardized on deeps which isn't for everyone as they are quite heavy when loaded with honey. You can also consider 8-frames wide instead of standard 10-frame width to lighten the load which is fine. Just make sure all boxes you buy are "8 frame". Wood frames with black plastic foundation - I've started to go all plastic where I live, but I don't recommend for everyone due to issues with small hive beetle. Where I'm at, for some reason, I have little issues with beetles. I recommend wood frames, with black plastic comb that snaps in easily. This makes it easier to see larvae in sunlight. It holds up better for extracting (usually). The solid wood frames seem to provide less habitat for small hive beetles to hide compared with solid plastic frames that have little nooks and crannies. If you have to feed, internal frame feeders - I really don't have to feed much with how I manage my hives except overwinter with solid sugar blocks. That said, I do have to feed sometimes and I simply use internal plastic frame feeders which are simple, easy and cheap for liquid feed. Inner cover with an opening - I like using inner covers but it isn't absolutely necessary. I like using those with small notches on one or both ends to allow for some ventilation. Screened or solid bottom board - I mostly have screened bottom boards, but am moving back to solid bottom boards. My purpose was to help mitigate mites reattaching to bees when they drop but have never seen definitive proof of this. I've been housing and overwintering nuc hives with solid bottoms for years with no issues, so have finally determined to consolidate and do all solid. Standard telescoping cover or insulated poly covers - I have personally standardized on foam insulated covers from Beemax and use them year round. They are telescoping and are enough top insulation for sometimes harsh winters in Cleveland. They, however, also aren't absolutely necessary. I also throw 2 inches of high-density foam on top of nuc hives I have with just a wood cover (not even telescoping). Buy bees from local apiaries, not out of state - I've broken this "rule" myself and have done okay, but I think there is much wisdom in starting off well and giving you and your bees the most chance. I think it's far more responsible to source bees from a local beekeeper with a good track record, good overwintering success, and with whom you can shake their hand. Their overwintered bees and queens will genetically already have a leg up on bees raise far away in other climates and forage. If you can, obtain local nucleus colonies ("nucs"), not packages (which are likely not from your state) - Buying a nuc will give your colony a head-start. In fact, it's already a viable colony with all the resources ready-to-hand to explode with growth assuming good weather, good management, and queen & colony health. Packages, on the other hand (either from near or far), consist only of an unrelated queen added to a couple pounds of bees that will endure the stress of transport. Once installed in your hive, they first have lots of work ahead of them to build out wax and build up some brood all while they slowly are losing bees for three weeks. It's possible, and I've had success with packages, but the cost is minimally different which begs the question: why not buy a nuc? Animal husbandry, not "live-and-let-bee" - As good as it sounds (and I'd love for everyone to get on this same page and give it a go), I just don't think it's reality to think that, with our current structures, laws and freedom of movement that we'll ever be able to coordinate a nation-wide effort to allow bees to fend for themselves and let natural selection do the work of straining out genetics resistant to mites and disease. On the flip side, I've seen *great* progress just in my own yard (and with other beekeepers) over the years allowing for open mating, selecting for good traits, using management practices like OTS and only treating with common-sense approaches like oxalic acid when necessary. Good management practices also *must* include consistent testing for mites - you need to know the true status of your colony health and mite counts and not rely on intuition or guesses. We should care for our bees like a good farmer would his animals or crops. Consistent inspections and observation - Excellent beekeepers have consistent and methodical inspection practices. I personally check on my bees at least once every other week, sometimes more often depending on the time of year. An experienced beek will be able to very quickly get into a colony and assess it without disturbing the bees too much or taking much time. This will make all the difference long-term in the health of your colonies. Unless you are actually looking at laying patterns, nectar and pollen resources, signs of disease, brood size, etc, you actually aren't taking care of your bees. There's no shortcut to this. If this is outside your comfort zone or time availability, don't become a beekeeper. A mentor is an invaluable asset to help you learn these techniques over the course of a year or two, by the way. If one isn't available, search our videos online from older experienced beekeepers and observe. A good inspection process - Each month is a bit different. You'll be looking for different things when you visit your yard. Settle beforehand what your main goal is for all colonies and focus on getting that one or two things done quickly. Ensure your process includes thinking and planning before you ever drive or visit which will dictate what tools and equipment and even clothing you bring. You'll want to arrange your hives and equipment in such a way that you are able to quickly move through inspections, replicating the same tasks in order and with slow, but meaningful movements. You don't want to be in a rush, yet you want to be in and out of a colony as quickly as possible. One of the main things to keep in mind, especially as you begin, is the safety of the queen. Many new beekeepers shoot themselves in the foot by injuring or killing their queens and don't even know it. Read up on how to do inspections for a few different sources which will help fill in the gaps and give you very important tips. Keeping records - With any beekeeping strategy or methods, record keeping is a must. With a hive or two, it's much easier to manage details in your memory, but that will only last so long and you'll find yourself making mistakes or guessing. With OTS, I find that I *must* track at every hive dates for when I notched, or added a queen cell, evidence of queen laying, etc. This takes all guesswork and mistakes out of the equation. I've personally created my own easy system using duct tape and a sharpie. I take a strip of duct tape, stick it together about 8 inches long, etc which makes a water-proof document to pin to every hive. I simply bring a sharpie with me *every* time I visit my hives and ensure I make a quick cryptic note with a date every time I do or see something meaningful. Next time at the hive, all I have to do is glance and see where I left off. Beautiful. Reading and learning - Show me a reading beekeeper and I'll show you a good beekeeper. Not all books are created equal and there are many I think aren't worth reading. So, choose wisely. Learn from the greats in the past. Remember there's not much new under the sun. Be humble enough to admit that you don't know much and won't for a few years. Here's a good post of 11 books I've found helpful, including Mel's book about OTS queen rearing. Common diseases - It's important to get up to speed with the different diseases that can afflict bees. Let me note that, healthy queens and managing mites, in my opinion, will mitigate much (but not all) of the problems many run into with disease. The one disease that will require you to destroy your hives is American Foulbrood and I've not personally seen it any of my hives in both Oregon and now Ohio, but it does happen. It's vital that you understand the signs and know how to diagnose with helpful tools like the "sticky rope test" and the smell associated with it. I recommend highly the disease info found in the book "The Beekeeper's Handbook" but there are many online and book sources that are helpful. Warning signs in general that would indicate problems with your colony would include things like: large numbers of bees walking and wandering about on the ground, bees with strange wing configuration (k-wing, etc), shaking/glossy looking bees, low numbers of bees on the frames, spotty egg laying, excessive bee poo on the front porch or *any* inside the hive, strange sour smells, aggressive behavior, low stores of pollen and nectar, laying workers, etc, etc, etc. Common pests - Most beekeepers will deal with small hive beetles, wax moths, and varroa mites as the main pests to deal with. You want to learn about all of these in advance and understand signs of and how to prevent, and how to deal with. A note: ALL hives have mites to some degree or another. Not dealing with them proactively from both an education and practical standpoint will end only in high losses in the Fall and Winter (and sometimes Summer). Seasonal considerations - A "healthy" colony progresses through different phases and stages through the course of a year. A robust overwintering colony will look and behave tremendously different from a late summer colony and have much different needs. Be sure you are looking ahead maybe 2-3 months in advance, checking with local beekeepers or supply stores and consider what the next season requires, what a healthy colony will be looking like and what they'll be needing from you, their keeper. What a healthy colony looks like - This varies greatly during the course of a year. Let's pick just one point in time, say Early Spring. At this point, a healthy colony will have a queen kicking into high gear. You should see frames full of eggs with few or no missing cells. You should see a few frames fully capped with brood as well. You should see nurse bees covering open brood and some over capped brood. You should be seeing many workers coming in with both nectar and pollen. The colony should have at least a couple frames of honey, at least around the edges. A colony that's progressing well at this time should be filling up all of a box and more, requiring you, their keeper, to ensure they have enough room to lay and plenty of room above for nectar. At this time it's very common for bees to swarm. A healthy colony swarms! You have bee ahead of the game on that score and know the signs both in weather, plant sources, colony size and space needs, swarm cells, etc. Food stores - A healthy colony lays their brood in more-or-less an oval shape in the hive. Just next to open brood you should be seeing a minimal amount of pollen and then honey around the top edges. Above the brood nest, you should be seeing bees beginning to fill out frames with just honey. A brood nest is no larger than 8-10 frames of brood that can be spread out if not managed well. Try to keep them in 2 deep boxes and no more. A healthy colony by Fall will have both produced excess stores for you to harvest *and* filled a deep box above (unless you harvest that also and feed it back to them as sugar.) Food stores vary during the course of a year and you will need to learn the differences. It's all about the queen - A young healthy queen is vital. No eggs, no colony. The larger the colony, the more stores it can obtain. This is all dependent on the colony and it's queen laying enough eggs and being able to nurture this brood to maturity at a rate that keeps up with available resources near them. With OTS, all my colonies go into Fall with newly mated queens in June. The past couple decades have seen issues crop up with older mature queens - some think due to environmental exposure to pesticides both in drones and queens. I find that maintaining healthy young queens enables me to stay ahead of that issue and I have no problems. 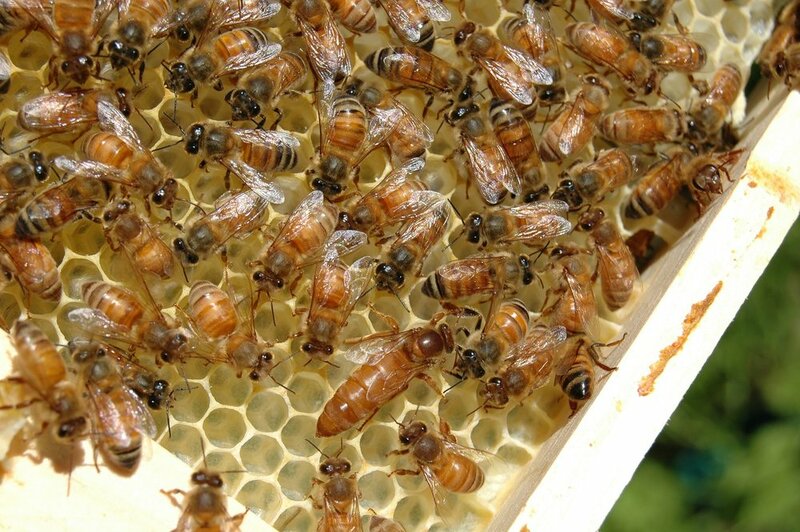 As you raise your own bees and queens, you will find increased success with overwintering and local genetics. Any beekeeper can raise quality queens in their own backyard with a minimum of effort. It just takes a measure of understanding, practice and planning. Beekeeping is local - Even within the same town there are differences with forage, water and other factors. There's no way around it: beekeeping is local. It's important to learn from your experiences and learn from others nearby, limiting what you take in from outside your community. One area can experience a dearth while another is doing just fine. Keep in touch with bee suppliers, beekeepers and clubs nearby for advice and dates. Weather and locale - Every year of course is different when it comes to weather. An excellent beekeeper learns to pay attention to weather and act accordingly. This can mean feeding or not feeding, wrapping or not wrapping, splitting or not splitting, notching or not notching. I like to keep an eye out a week in advance and think through the implications. As well, I also think ahead a month or two about the averages and what they imply for my management. Find a club or old-timer - Or do both! There's so much wisdom to be had just hanging out with an old-timer who's seen it all. There's much wisdom to be gleaned (and sifted and sorted through) collectively from a club. And, all these can be obtained through books as well, to some degree. But, there's nothing like getting hands-on experience or sight. A good beekeeper is in tune with local pollen and nectar availability throughout the year - An excellent beekeeper is an observant beekeeper. One begins to understand and see the signs of incoming nectar, pollen or neither. Importance of pollen - Bees don't survive without this source of protein. They can't stay healthy without it and they can't raise brood without it. Keeping tabs on pollen availability, amount in your colonies, etc is vital. Caring for bees in a flow - If a flow is on, one needs to ensure there's enough space to handle the nectar. This could mean adding frames/boxes, harvesting and returning the frames, or checker-boarding, etc. You want to take full advantage of a flow. You want robust colonies peaking at this point as well. You also don't want brood nests backfilled with nectar and swarming impulses started. Caring for bees in a dearth - Bees in a dearth may need to be fed. They likely need water. They need good ventilation, but it needs to be "bee tight" to prevent robbing. Weak hives may need help to prevent or shut down robbing. A good beekeeper is anticipating and looking for these signs. Beekeepers are *always* busy! Even with a couple hives, once must always be thinking and preparing a few months in advance. Getting a feel for the annual cycle of things and the responsibilities each season requires is one of the fundamental aspects of good beekeeping. I’ve broken the general ebb and flow of the year into seasons below to help you think through your calendar and planning in your locale. Swarming is a natural part of the honeybee lifecycle. Each year, when colonies are at full strength and weather conditions are right, they will choose to swarm with little you can do to stop them. Before moving on, let me address some misconceptions. I hear over and over again that if one uses OTS methods or articially swarms/splits his bees at this point, he is losing ground by weakening his hives. This is true only temporarily! What is not understood is the long-term net affect of a.) not losing bees to swarms, PLUS the ability to b.) accomplish your goals: honey, colony increase or both, ALL without losing sleep or having to constantly monitor hives for swarm cells (a great time saver). Is your goal is honey production? Just recombine your splits a month later for power-house honey hives. Is your goal colony count increase? You can take any overwintered hive and not only prevent swarming, but increase it easily five or six times over during the spring and summer (no kidding). TOTAL: from 11 starting colonies, 21 were sold and 32 overwintered totaling 53 colonies. As mentioned, selling nucs was my primary goal yet I also harvested hundreds of pounds of honey in addition for my large family with some to sell to friends. If honey production were my aim, I would have kept my colony count around 10-25 by re-combining colonies throughout the season in my little yard and put effort into managing for nectar accumulation. OR, if I were going after only increasing my colony counts, I would not have sold 21 but rather used those to increase even quicker with 11 easily becoming 70+ colonies for overwintering... ALL without purchasing any queens or bees. To be honest, what keeps me back is space and money for equipment, NOT losing bees. I will give more specifics on how to raise queens and increase colony counts via OTS in the “Raising Queens and Colony Increase” section below. I’ve already touched on overwintering above but let me add to this more specifically in terms of colony loss. The goal for overwintering is simple: survival. Its true beekeepers are increasingly losing bees during the summer months but the vast majority of losses occurs at some point in the overwintering period from late Fall to very early Spring. What are the main culprits for these losses? Here’s the bottom-line way to deal with these culprits: the vast majority of these cases can be mitigated by 1) proper overwintering techniques for your area, 2) managing mite levels in your hives throughout the season (pick your methods), and 3) overwintering with young queens. I personally have had great success using OTS to manage mites and raise queens without having to resort to miticides except on rare occasion. I actually AM leaning towards the more consistent use of oxalic acid during the complete brood breaks in my apiaries which OTS naturally gives me. This will be a great one-two punch in my opinion without sacrificing my desire for natural approaches to beekeeping too much. There are a few voices out there with some form of “live and let live” or similar “natural beekeeping” methods, usually with a view towards encouraging good genetics over time without using chemical or management props. I respect their opinion and agree with much of their thinking, but I’ve found OTS to be a good balance towards short and long-term sustainability. I’m both raising my own queens over time and letting nature take its course AND I’m not relying on harsh chemicals that absorb over time into my wax and food supply. As well, I think OTS is accessible to any beekeeper, new or advanced, without some of the risks and issues inherent with “live and let live”. These folks would push back and say even brood breaks are not natural and prevent true progress, but I must counter with the fact that bees are a special kind of insect that were created to work with mankind and dependent on management by humans to thrive. Bees do best when we shepherd and tend to them. They don’t last long when left to their own devices. I think it’s a good balance. * There is one caveat, something out of our control at times: chemical exposure to our bees from neonics and other agri-chemicals can decimate or slowly poison colonies over time, irrespective of your good beekeeping practices. One must be aware of corn and soy farming especially in your locale and plan accordingly. I personally seem to have little issues with this in my suburban, wooded setting. The following outlines the OTS (“On the spot”) method for raising queens. Other options for obtaining queens would be either normal and difficult queen-rearing practices such as grafting or purchasing them. Why is raising your own queens via OTS preferred? How do you simply raise OTS queens? Come back one week later and you will find fully mature and capped queen cells on the frames you notched and possibly others. You can cull down to just two cells, or split up the frames into 2 or 3 colonies, depending on resources available. 30 days from the original notching, you will have laying queens in approximately 90% of your colonies (some queens will get eaten by birds, etc) if weather has been decent. A very important note: You simply cannot short-cut the above steps by allowing small nucs to raise the queen cells. This is a common mistake and the cause of much misconception regarding the validity of the OTS method. Small nucs simply can’t raise high-quality queens. All the cell building and feeding of queen larvae must be done by the original full-strength colony. Splitting up the notched frames into nucs first and letting them raise cells just won’t work. Wait one week for all cells to be capped and THEN split into small nucleus colonies. If you have any questions, suggestions for edits above or things you find unclear, just let me know via email or in comments below. I received a kind email from a beekeeper in the northeast with several questions. I thought I would include it and my responses as a post this morning. Name and location is removed. Feel free to drop related questions into the comments below. "Hi John, I am happy I found your website! I am a fairly new beekeeper, entering my third year. I live in [Connecticut] ... I believe, like you, I live on the 41st parallel." "I've lost my (package) hives both years to varroa. Great buildup in spring, but crash by fall or winter." This would be classic sign of varroa buildup and overload. 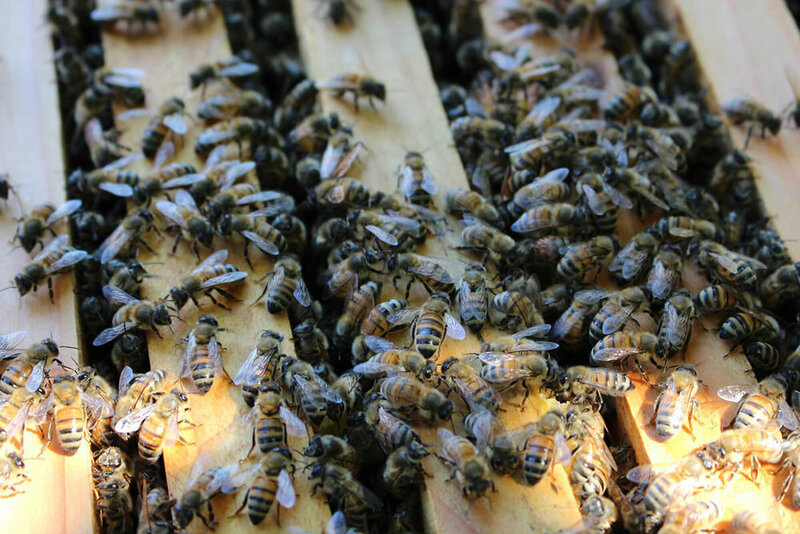 "Each year I have had 1 hive that could have been a cell builder, had I known about OTS." Yes! You got it... every beekeeper should understand this so that they can become self-sustaining. "I am thinking I need to change course if I am to keep bees alive (without chemicals)." This is good thinking, and for most, requires some hard knocks and a couple years of losing hives to sink in. One must deal with varroa and pesticides these days ― those are our main enemies. With varroa, one must either outbreed and mitigate some varroa's lifecycle (OTS), use Oxalic or Formic acid (I do sometimes), or both (that is my current plan). I personally have got by with 60-70% survival *just* with OTS and for most that's enough. But, I'd like to see 90% and think I can do so by oxalic acid vapor at the proper time in conjunction with OTS. "Do you think using packages to start it is possible to do OTS? I'm thinking so long as I have enough brood frames (4+) it should be possible." Yes, when I moved from the west coast to Ohio about six years ago, that's how I started over again. I prefer to buy nucs to get started, but I didn't know anyone and went with two packages. I sourced some Carniolan packages and started from there. They will build up enough by the end of June to put them through the OTS plan. Two packages could easily be increased to six colonies 30 some days later. You'll want to feed them heavily. "If so, do you think overwintering nucs is viable or is it better to combine starts to over-winter?" Yes, I have overwintered 5-over-5 nucs successfully for some years. Stacking them together with good top insulation (foam, etc) does nicely. I personally am working to standardize more and just overwinter single deeps with a sugar rim (creating space to feed sugar blocks on top). Mel Disselkoen states his success over many years overwintering single deeps successfully with OTS if there is 4 frames of brood and 6 of honey by Fall. My own experience bears this out as well. "I use Layens hives, whose comb surface is roughly 30% larger than a Langstroth deep frame. I have a lot of comb and honey frames from last year." Interesting. I've not heard of that before. I've read about Brother Adam's findings some time back that suggested larger brood areas were beneficial (in U.K. climate). But, alas, we've standardized on Langstroth here in North America and they do well enough, in my humble opinion. "Do you have a dearth where you live?" In the Cleveland, Ohio area here, we have highly fluctuating conditions year-to-year. Some years I pull in nectar all year long, but more often we'll have an August dearth (broadly speaking) until Goldenrod bloom kicks in until first frost. "Thank you for your time"